September 28, 2009, Little Rock, Arkansas — Employees at the Dassault Falcon aircraft plant today faced a second round of employee cuts. The company announced it would layoff just over 70 employees and additional workers would be let go through its “early out” program. In June over 120 employees got pink slips. Dassault Falcon had employed over 2,500 employees in its Little Rock satellite plant. This plant is responsible for completing the interiors and painting the aircraft before it is handed off to customers. The Dassault Falcon aircraft are built in Bordeaux-Merignac, France and flown to Little Rock in a "green" condition where they are outfitted with full interiors, options and an exterior customized to meet each customer's needs. Dassault Aviation is a French aircraft manufacturer of military, regional and business jets, a subsidiary of Dassault Group. It was founded in 1930 by Marcel Bloch as Société des Avions Marcel Bloch or "MB". After World War II, Marcel Bloch changed his name to Marcel Dassault, and the name of the company was changed to Avions Marcel Dassault on 20 December 1947. In 1971, Dassault acquired Breguet, forming Avions Marcel Dassault-Breguet Aviation (AMD-BA). 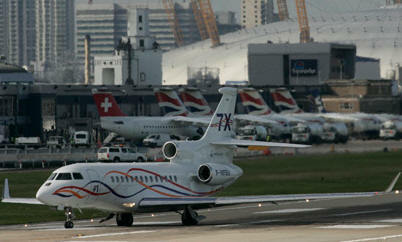 In 1990, the company was renamed Dassault Aviation. In 1979 the French Government took a 20% share in Dassault and established the Societé de Gestion de Participations Aéronautiques (SOGEPA) to manage this and an indirect 25% share in Aerospatiale (the government also held a direct 75% share in that company). In 1998 the French Government transferred its shares in Dassault Aviation (45.76%) to Aerospatiale. On 10 July 2000, Aérospatiale-Matra merged with other European companies to form EADS. In 2008, Dassault Falcon completed an 116,000 square foot expansion to its Little Rock Completion Center. The $20,000,000 expansion grew the facility to a total of 897,000 square feet and also included a new production and design area, more warehouse space and a new flight line. "Demand for Falcons had been unprecedented over the past several years and that has led the company to expand production capacity around the world," said John Rosanvallon, President and CEO of Dassault Falcon. The state-of-the-art 66,500 square foot paint hangar is a four bay EPA Title V approved facility specializing in the application of "high-solids" aircraft exterior paint and design. The paint hangar includes a state-of-the-art air filtration system with air being circulated several times in the course of a few minutes. The downdraft airflow system offers a constant flow of clean air to remove the over-spray during painting operations. This system offers a virtually pollution-free environment for the paint personnel to apply the topcoat and primers. This is the third such paint hangar Dassault has opened in Little Rock and Wilmington, Delaware in the past five years.